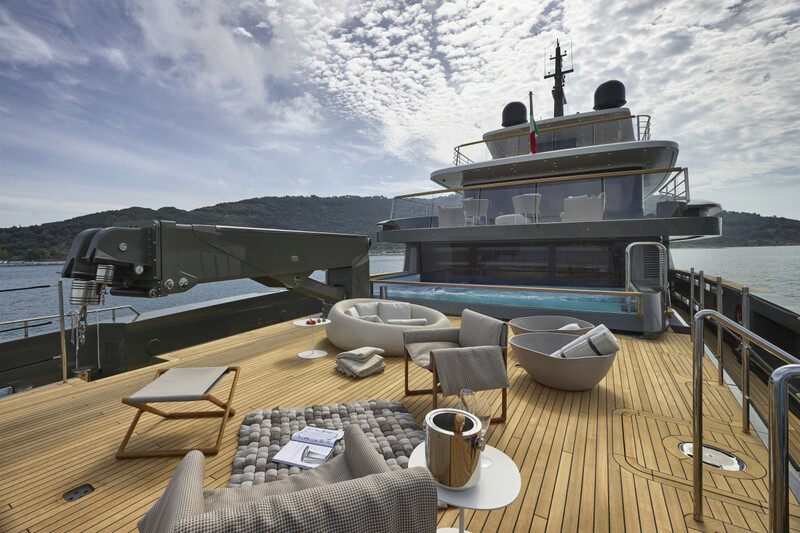 Sanlorenzo’s 138-foot (42.2-meter) expedition yacht is far from the largest in the builder’s line, but she is easily the most distinctive. In a range of fiberglass, aluminum and steel craft from about 80 to more than 200 feet length overall (25 meters to 64 meters), the tough and purposeful 460EXP stands out as a yacht designed not merely to go places, but also to have adventures. Moka’s upper deck salon. In a later 460, this area was fitted out as the master stateroom. The forward superstructure gives the yacht a businesslike profile, with the main deck aft reserved for tenders and toys. The first 460, Moka, sported a Chris-Craft speedboat in that space, while subsequent yachts have mounted seaplanes and mini-submarines. The hefty 4-ton crane can cope with pretty much anything that will fit within the 29-foot-6-inch (9-meter) space. More toys can be stowed in the garage below, although Moka’s was fitted out as a beach club. 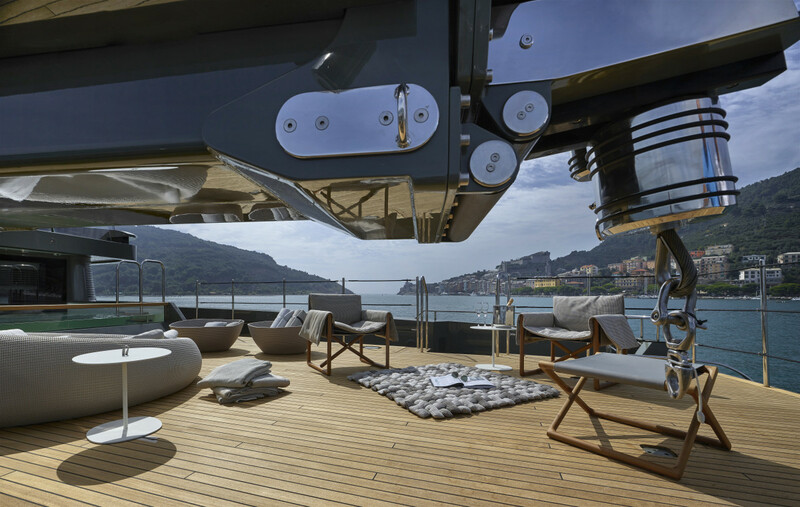 The aft deck is laid out for relaxation at anchor, while that four-ton crane reveals its alternate purpose. 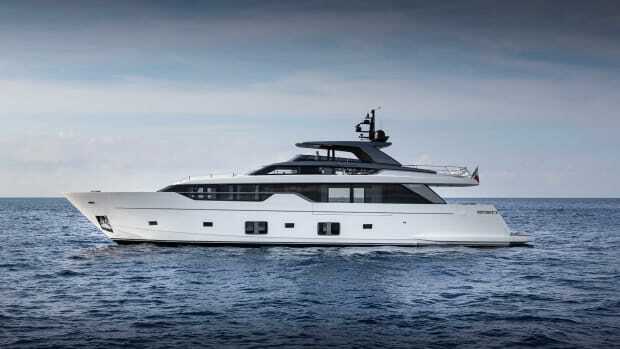 The model designation 460EXP comes not from the yacht’s length, but instead from her volume, with internal spaces that add up to some 460 gross tons. 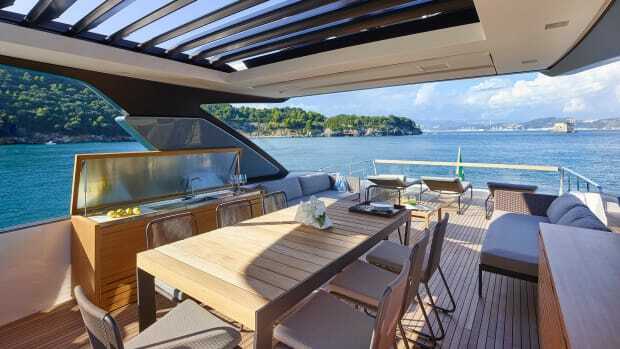 There is no mistaking the sense of spaciousness aboard, especially with 7 feet of headroom throughout the guest areas and broad deck areas with windows that admit plenty of light. View of the main deck salon, looking forward. 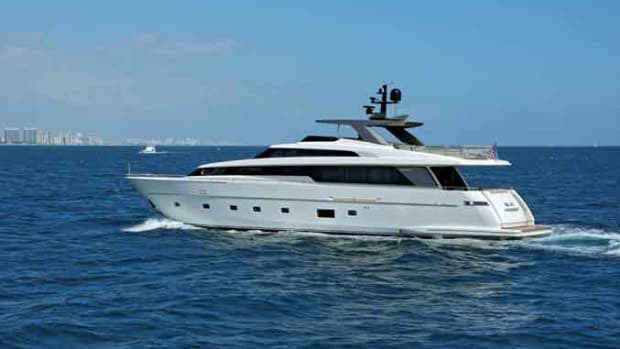 Sanlorenzo builds customizable yachts, which means owners have options when it comes to layout. 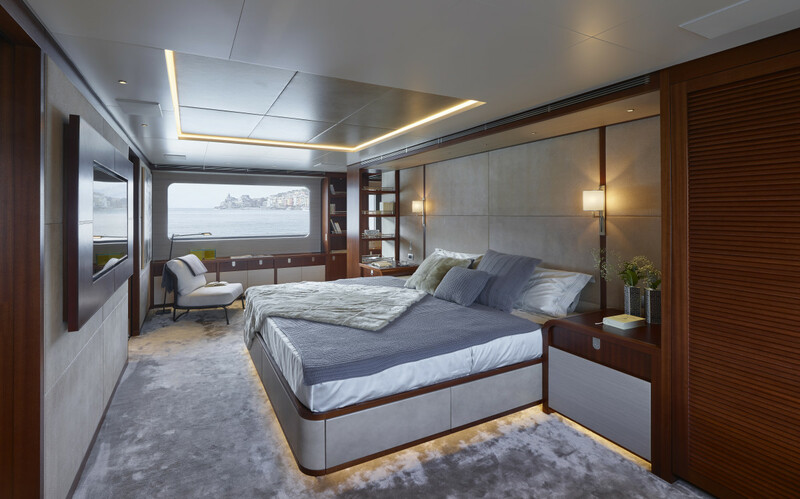 At least one owner has turned the 460EXP’s upper-deck salon into a master suite, which, although smaller than the standard one on the main deck, is a tempting idea because of the views. 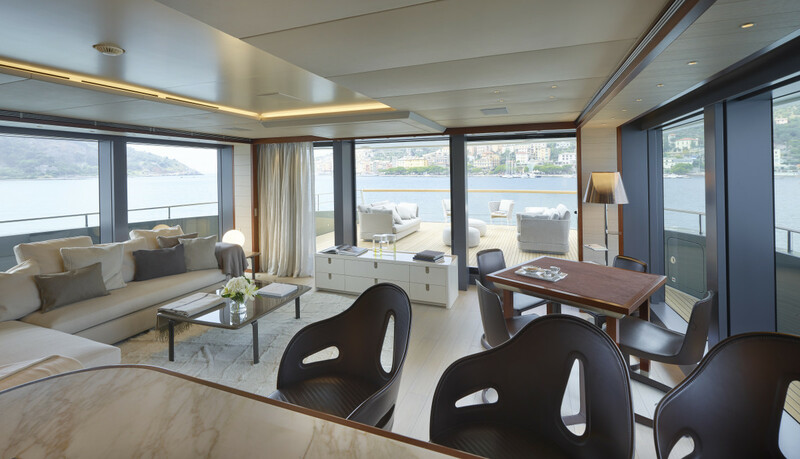 Moka has five ensuite staterooms below: two VIPs aft, and three staterooms with twin sliding berths. The sixth stateroom on Moka serves as a gym. 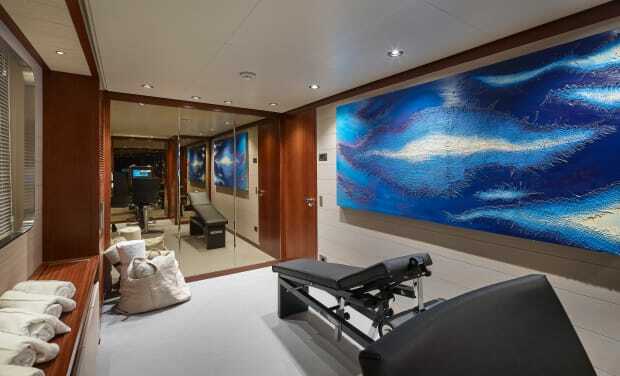 Sanlorenzo also gives owners an unusual degree of latitude on interior décor. Moka’s interior has white oak floors, rosewood paneling and colorful leather accents. The quality of fit and finish can be seen in numerous places, including hefty teak handrails along the side decks and rubber mountings beneath the sole for sound attenuation. Moka’s master stateroom is forward on the main deck. 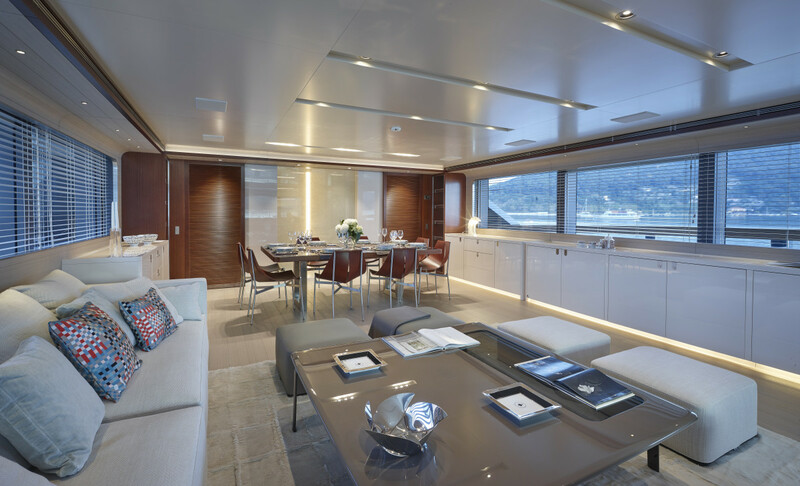 There is space for six staterooms down below, or in Moka’s case, five, plus a gym. In addition to being customizable, the 460EXP’s interior is also highly functional. A companionway to port gives the crew access to the deck, galley, pantry and wheelhouse, while guests can use the central spiral staircase from the lower deck to the sundeck, as well as an external companionway to starboard. 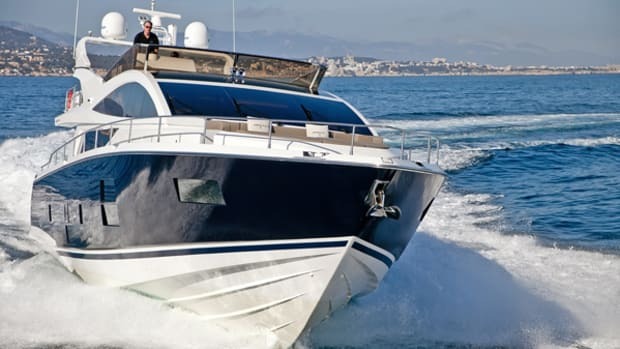 With a waterline length of 125 feet 3 inches (38.2 meters), the 460EXP’s notional hull speed, according to the accepted rule, would be 15 knots. The design’s drag-cheating bulbous bow, however, adds a little to that. 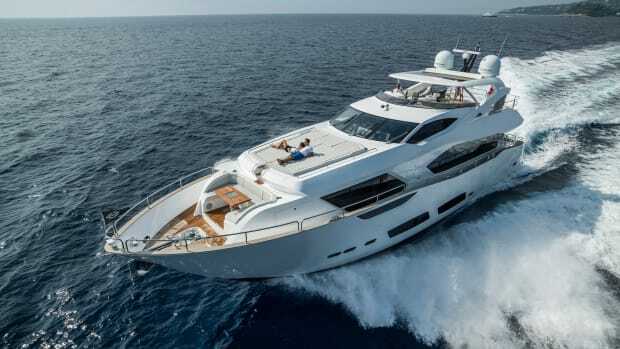 During the shipyard’s sea trials, the yacht made her predicted maximum speed of 16 knots in displacement mode, with a total fuel consumption (including one generator) of 161 gallons per hour. Allowing for a 10-percent fuel reserve, cruising range at full speed translates to nearly 1,200 nautical miles, or 2,200 miles at 14 knots. At 10 or 11 knots, the yacht’s reach is comfortably transatlantic. 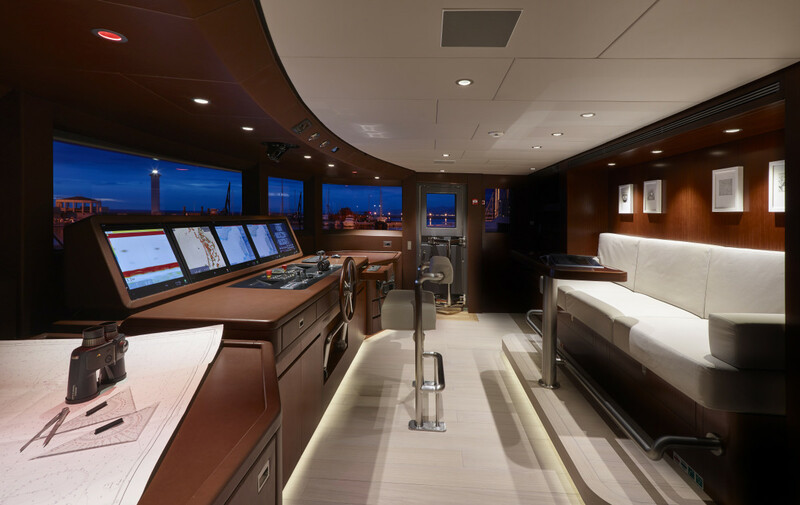 The aft deck, which can keep a tender—or anything else—of up to 29 feet or 4 tons. The garage space underneath it is fitted out on Moka as a beach club. Capt. Clay Dall’Ara knows all about that, because his first job on taking delivery of Moka in Italy was to prepare her for delivery across the Mediterranean and the Atlantic, to her owner in Florida. 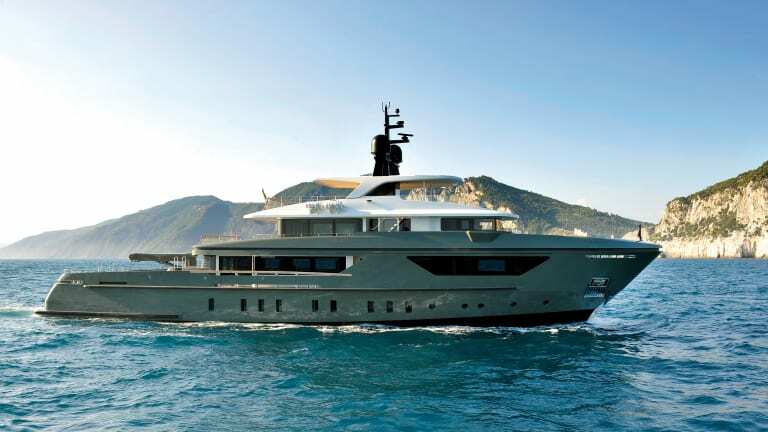 “Moka was fresh out of the yard, and the crossing was a real test,” he says, with the yacht having done three shipyard sea trials prior to delivery. 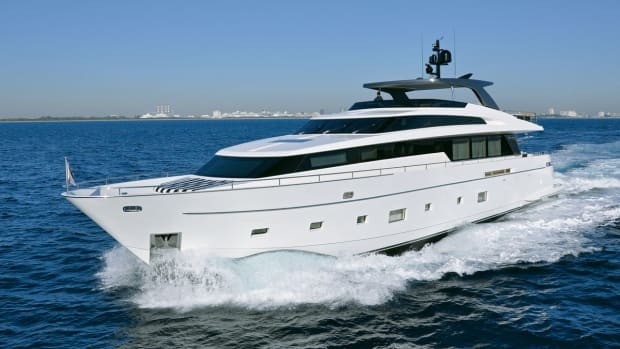 With a crew of nine, Moka set off from Viareggio in mid-December bound for Palma, Spain, to take on stores and spares, and then headed to Gibraltar for fuel. 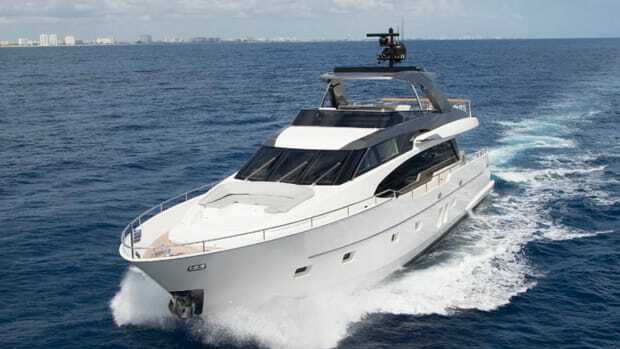 After one more stop in Santa Cruz de Tenerife, 700 miles into the Atlantic, Moka struck out for Sint Maarten and then headed northwest, past the Virgin Islands to West Palm Beach, Florida. The yacht made landfall after a total of 19 days, having covered 5,600 nautical miles at an average speed of 12.5 knots. Nobody who has followed Sanlorenzo’s EXP project would be surprised to hear that. 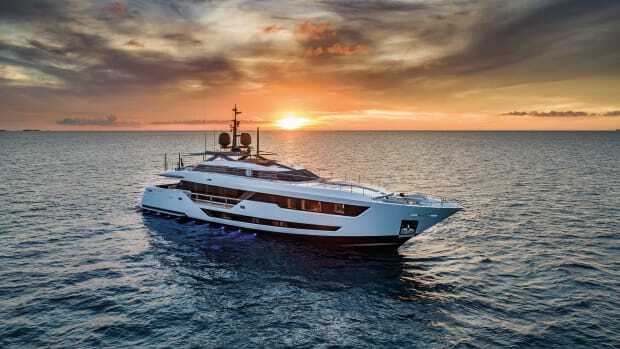 From the first sketches of the sturdy steel displacement hull to designer Francesco Paszkowski’s draft of the purposeful profile, it was clear that Sanlorenzo intended to build something special. 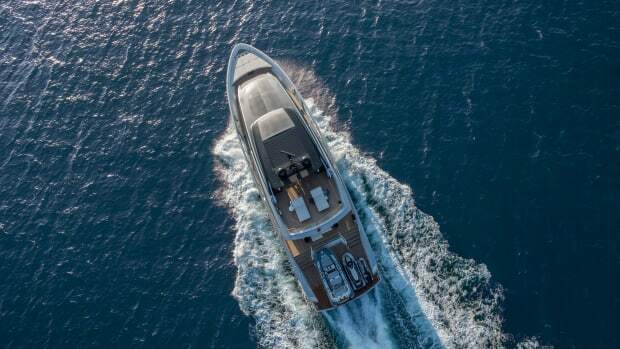 The 460EXP might be of modest dimensions compared with some of today’s explorer superyachts, but she has cruising capabilities limited only by her owner’s ambitions. She is a yacht for having adventures. The key to long-range cruising is often thought to be fuel capacity, and the 460EXP can carry about 13,200 gallons (50,000 liters), but on extended itineraries, stowage is equally important for food, drink and general stores, not to mention garbage. To this end, the 460EXP has a central corridor beneath the lower deck with enough volume to hold six refrigerators and freezers, along with two technical areas. Sanlorenzo estimates that a 460EXP could cruise autonomously for as long as three months without having to enter a harbor. 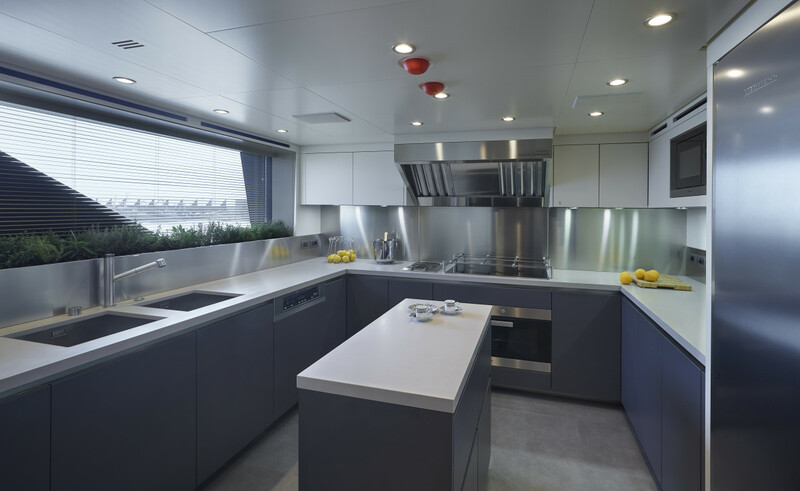 The galley, situated on the main deck.